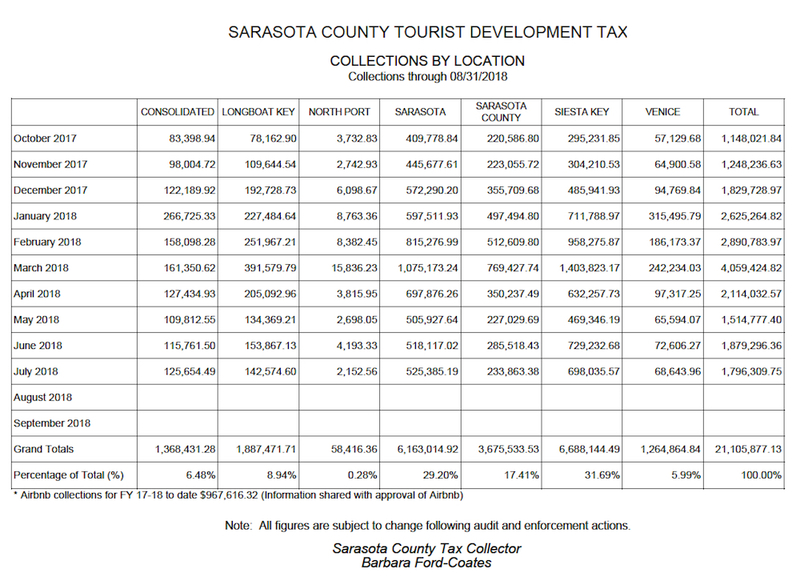 Although the Sarasota County Tax Collector’s Office report on Tourist Development Tax collections for the month of July shows little increase year-over-year, red tide does not get the blame, according to the president of Visit Sarasota County. “The new inventory of lodging rooms continues to have an impact on our numbers,” Virginia Haley wrote in an Aug. 29 email update to local government leaders, offering details about research undertaken for the tourism agency. She added that the hotel occupancy dropped by 4.3% for July, to 74.3%, and the hotel average daily rate dropped by 3.4% to $176.51. “The number of rooms sold, which indicated the new supply, grew by 4.1%” over the figure for July 2017, Haley wrote. Through this year, Haley told the county’s Tourist Development Council in June, the county will have seen an addition of 1,177 hotel rooms. That is a 23% uptick from the figure prior to 2016, she noted. “Impressions” refers to the number of people who have heard, read or seen an item. Year-over-year for the month of July 31, the “bed tax” revenue for Sarasota County was up only $5,390.88, according to data released by Tax Collector Barbara Ford-Coates’ staff. Previously, only one month showed a year-over-year decline: April. However, audits and other subsequent revisions have put April in the “plus column,” even if the increase as of July 31 was only $2,599.09, compared to the bed tax revenue for April 2017. 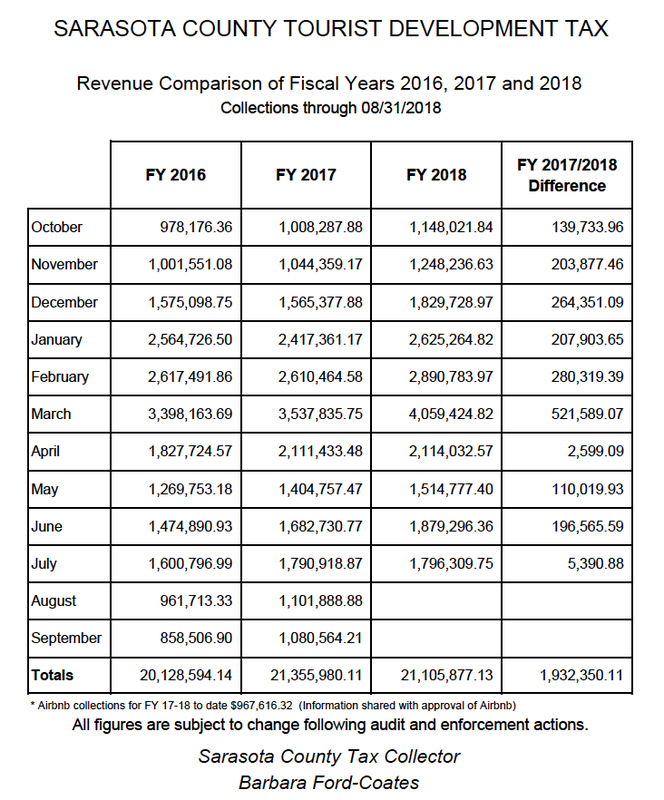 For the fiscal year that began Oct. 1, 2017, overall revenue through July 31 remained on course for a new record, the latest reports show. The total was $21,105,877.13, which was $1,932,350.11 higher than the amount collected for the same period of the 2017 fiscal year, the report says. The county has set records for its TDT collections every year since 2013, when it increased the tax to 5%, Carolyn N. Brown, director of the county’s Parks, Recreation and Natural Resources Department, told the County Commission in August. Last year, the total was $21,355,980.11, the Tax Collector’s Office says. As a result of audits and other reviews that have led to the posting of revised figures, the year-over-year differences have continued to climb for every month except October 2017, based on the latest data. For example, the revised figure for March in the latest report shows TDT collections up $521,589.07 compared to the total for March 2017. The figure in the previous report showed a year-over-year increase of $518,027.28. For another example, the new report shows that June collections for this year were up $196,565.59, compared to the figure for June 2017. In the previous report, the number for June this year was $172,995.98. Additionally, Ford-Coates’ staff has reported that through July 31 that Airbnb hosts in the county had collected $967,616.32 of the total TDT revenue since the fiscal year began on Oct. 1, 2017. Siesta Key entities that collect the bed tax continue to lead their counterparts in all other locations, the latest data show. Through July 31, Siesta Key accounted for 31.69% of the TDT revenue for this fiscal year. The city of Sarasota remained in second place, with 29.20%. 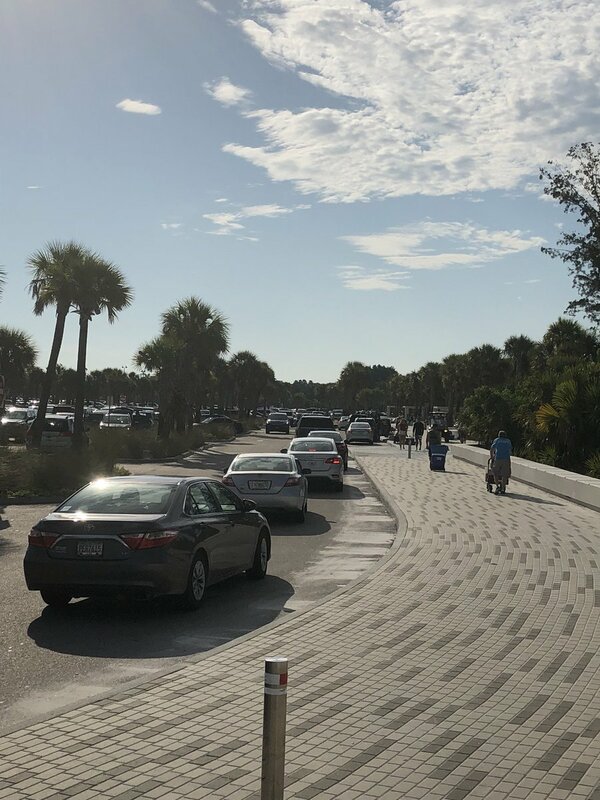 Haley of Visit Sarasota County also noted in her report that the number of visitors in July was up 1.9%, compared to the figure for July 2017. The total for July this year was 118,000, based on research undertaken for Visit Sarasota County.